The well-attended Help Sergio in the Unitarian Church was a fantastic night of entertainment. Many thanks to everyone who helped organise this enjoyable evening of music and song. It was great to see so many friends in attendance offered their support for the Help Sergio Campaign. Go raibh mile maith agaibh agus go mbeirimid go leir beo ar an am seo aris. 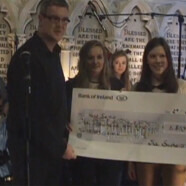 This video includes performances by Sergio’s family and also teenagers who raised €1800 from busking on Christmas Eve.